The Killer Bug certainly lives up to its name. It is such a simple yet stunningly effective pattern, season upon season. Sticking firmly to Sawyer's original concept we have made every effort to replicate as closely as possible. Today the Killer Bug proves how devastating effective it is on a wide variety of waters by bringing fish to the net regularly. Sawyer said, "The successful attraction of this pattern is due to the fact that the particular 'darning wool' used completely changes colour when wet." Frank Sawyer (1907-1980) the Wiltshire Avon river keeper. Hook : Kamasan B160 Grub 10,12. Thread : Fine copper wire. Underbody : Copper or lead wire. Body : Chadwick's 477 darning wool or Veniard's beige. Underbody was reputed to have been copper stripped from an old dynamo - today weighty alternatives are used. 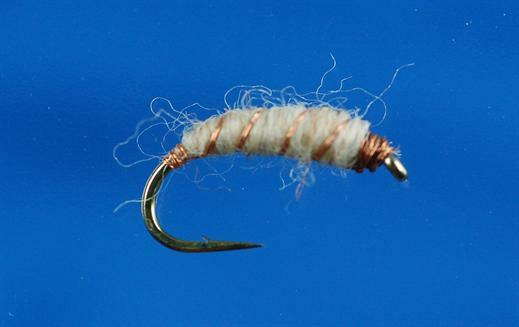 Chadwick's 477 has been discontinued but most fly tying suppliers have excellent shades of beige wool. (So has your local habadashery/needlecraft store). Currently there are no comments about the Killer Bug fly pattern from other fly fishermen yet.